The Select Point Tool allows you to select the points that make up items. Drag a rectangle around the points you want to select. To add or remove points from the selection, hold down the <Shift> key while clicking or dragging. Selected points are shown by a solid handle , Points that are not selected are shown by a hollow handle . To move the selected points just drag a selected point to a new location. 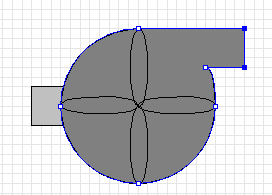 For how to use the select shape tool to edit entire shapes.